A glowing portrait of Martin Luther King Jr.’s widow by her sister. The daughters of a lumber hauler in Alabama’s Black Belt region who was constantly harassed by white employers for his enterprising ways, Coretta and Edythe Scott were both educated at the Lincoln School, a white-run missionary boarding school, and later Antioch College, in Ohio. Embracing the tradition of Christian service instilled by those establishments, Coretta attempted to student teach in the Yellow Springs, Ohio, public-school system in 1950, despite protests by white parents. However, Antioch did not support her, delivering a bitter lesson in the deeply entrenched discrimination that pervaded even the North. A gifted soprano, she attended New England Conservatory in Boston on scholarship, where she met the Georgia-born King, then was a doctoral divinity student at Boston University. Impressed by her long, straight hair and evident intelligence, King sensed she would make the perfect wife. At the time, Coretta began her career as a successful singer, and from King’s first pastorship at Dexter Avenue Baptist Church in Montgomery, to his last at Ebenezer Baptist Church in Atlanta, Coretta performed intermittently on stage. In 1965, she used a Freedom Concert tour to spread the message for civil-rights change. She was also committed to the antiwar group Women Strike for Peace, which attracted surveillance by the FBI. The author speculates about Coretta’s influence on King’s ultimate resistance to the Vietnam War, writing that the couple “shared vigorous and robust conversation about the issues they faced.” Steely, cerebral and unemotional, Bagley’s portrait reveals a remarkable character forged by harsh reality and unimaginable trial. 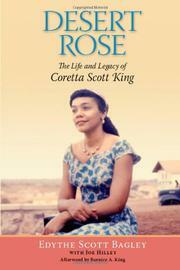 In an intimate glimpse, Coretta steps out from her husband’s shadow.